Arcade Video Game published 6 years ago by NAMCO Bandai Games, Inc.
マリオカート アーケードグランプリ デラックス © 2013 Namco Bandai Games, Incorporated. 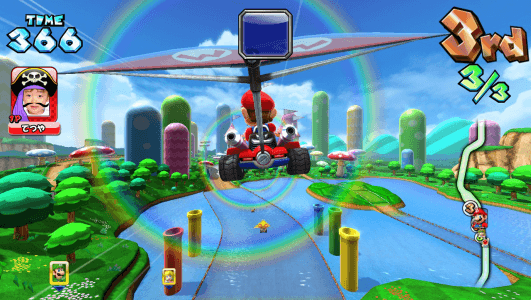 The third installment of the Mario Kart GP series comes more strongly with redefining hd graphics in the new generation, the game adds new additions, aerial and aquatic racing new power-ups more characters more tracks and more fun action racing. This game was shown at the Japan Amusement Expo 2013 (The 50th Amusement Machine Show / The 32nd AOU 2013 Amusement Expo in Tokyo Japan). Then, it was released on July 25, 2013. Don the taiko drum appears as a selectable character and a Taiko no Tatsujin themed course is available.